Digital mode access points, often called hotspots, have been in the news lately. Those are the 10mW personal devices used by digital operators to cover a relatively small area like a house, car, or hotel room. Instead of tying up a gateway repeater, which largely connects local users to the Internet, many have opted for these low-powered devices to provide similar functionality. Advantages over a repeater are the hotspot owner has complete control over which reflector, repeater, or talkgroup their hotspot is connected to. They are not beholden to the preferences of the repeater owner and have the flexibility to use their hotspot however they’d like. Many use them mobile in the car or take them on a trip allowing them to enjoy their favorite digital modes where there may not be repeater coverage. Hotspot devices in general are about the size of a deck or two of cards and require an Internet connection, computer to run the software, application or web browser for configuration, and a radio capable of operating each mode. An Internet connection can be your home WiFi or cellphone hotspot (as in WiFi-hotspot). 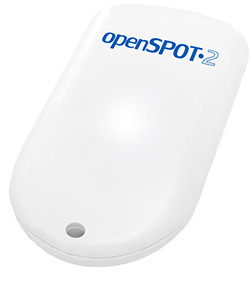 The original OpenSpot was the only device that required a wired Ethernet connection. A PC computer may serve as the Internet connection for USB access points. The computer could be a Raspberry Pi in many cases or might be completely self-contained. A web browser or application is needed to make configuration changes and adjustments such as call sign, transmit frequency, mode, or network. These hotspots are the RF gateway to the internet which means a radio capable of transmitting and receiving that mode is also required. Few hotspots today are single mode like the D-STAR DVAP. Nearly all on the market are capable of operating multi-mode and connecting to associated networks. To operate DMR the user would need a capable DMR radio, a capable Fusion radio for the Fusion networks, and so-on. A keen eye might ask about Wires-X, P25net, or DMR-MARC. Those networks cater to a specific manufacturer of equipment and are often closed to other vendors. You might be able to reach resources on those networks because someone has cross-linked a closed network with an open network, usually at the point where digital signals turn into analog audio. This is how a user can be on Wires-X America Link and talk with a DMR user. If your hotspot is operating within those frequencies or near the edges, within the weak-signal sub bands, or any other sub band likely to cause issues, you need to take corrective action now! “Usable” indicates the lower and upper frequency limits that can be used with a digital hotspot. Don’t forget to stay away from the national calling frequencies of 146.520 and 446.000. Some of these ranges are shared with repeater links so remember: it is your responsibility to ensure correct operation of your equipment and find a frequency not already in use before using it! There is NO excuse for not adjusting frequency to eliminate interference with other operators and equipment! Listen to the desired frequency by setting up a radio or scanner with the volume turned up. If you hear any kind of obvious traffic, data bursts, or digital screeching, pick another frequency then rinse and repeat. Your cooperation is greatly appreciated! Right after Dayton I started hearing rumors that the OpenSPOT was discontinued. Not the news you want to hear if you just purchased one at Dayton. The website eventually confirmed the rumors and that another device was to be announced “soon,” which turned into months. Finally, the SharkRF OpenSPOT2 was announced. This replacement addresses many issues of the now legacy device including the need for a wired Ethernet connection, limited portability, and lack of newer digital modes. 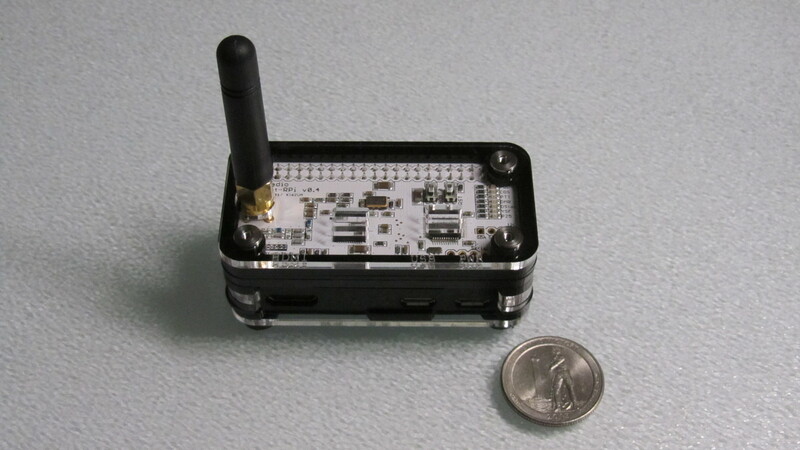 Feature-wise it is nearly the same but includes a much-needed internal WiFi antenna and support for NXDN and P25 (two up-and-coming digital modes in ham radio). It includes POCSAG which I’m not familiar but told is a paging standard. Those under 35 have no idea what a pager is. The device operates off a USB-C cable (included) and looks to be about the size of a computer mouse. It will still have cross-mode support for DMR and Fusion radios and networks. As with the previous, you will not be able to use your D-STAR, NXDN, or P25 radio in cross-mode. Release date is expected before the end of 2018. Stay tuned to their website and social media portals for exact date. At Dayton I added to my hotspot collection. On my shopping list was a ZUMspot or something I could use with the Pi-Star software. I picked up a ZUMspot kit and case from HRO. The kit lists for $130, $110 without the Pi board. The case adds $15. The kit came with the amazingly small Raspberry Pi Zero W (W for Wireless) and the ZUMspot modem board from KI6ZUM. You’ll need to provide a Micro-USB cable which powers both devices. I’ve seen demos and received feedback saying Pi-Star was a great application to use – and is stable. Many had issues with the DVMEGA (in particular) getting a good distribution that worked reliably with that device. 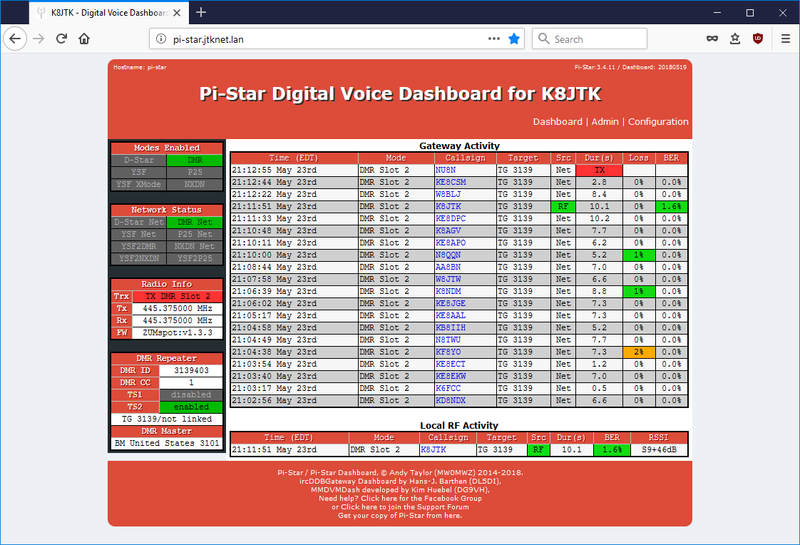 Pi-Star is software written by Andy – MW0MWZ. It is distributed as a Raspberry Pi image for use with Digital Voice modems. All configurable options are available through the web interface. It’s convenient and you don’t have to mess around with multiple interfaces or carrying around a screen for the device. Services like SSH are available but generally not needed. Before I tried to use the image, I knew I had an issue. Since this was my first Pi device without a wired connection, I couldn’t edit the WiFi settings by wiring it to my network. Instead I mounted the SD on a Linux system and edited the /etc/wpa_supplicant/wpa_supplicant.conf to include my WiFi information. Booted the ZUMspot and it connected to my wireless auto-magically. The Pi-Star site has a utility to help create the wpa_supplicant.conf file. I’ve primarily used the ZUMspot on D-STAR and DMR but it supports all modes and networks mentioned earlier in the article. It doesn’t do as well as the OpenSPOT when D-STAR stations are marginal into their gateway. There’s more “R2D2” on the ZUMspot in that respect but it’s a minor issue. 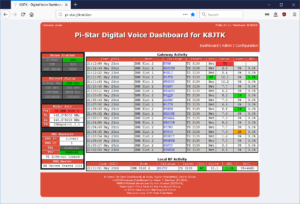 Pi-Star can enable multiple digital modes at one time. This is a great selling point and works great if conversations happen at different times on different networks. It is a “first wins” scenario. If a D-STAR transmission ends and one on the DMR network starts, nothing will be heard on the D-STAR radio until the DMR transmission ends. In other words, parts of an otherwise interesting conversation maybe missed. The case is a bit of a jigsaw puzzle but it’s fairly easy to figure out from the picture that was provided. The ZUMspot is an excellent little device and I’m happy with it. Dave – KD8TWG has been very busy recently. 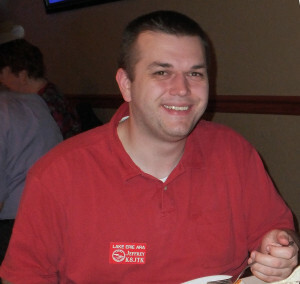 He was again in charge of the communications and networking for the Great Geauga County Fair where they run APRS tracking of their golf carts, setup a phone system and IP cameras to cover the fair. At the Cleveland Hamfest he gave his presentation on Digital Modes. He compared and contrasted modes available to ham radio operators, including quality and radio options. Updated for this year was information on digital scanners and receiving the MARCS statewide digital system. Coming up on October 30, he and a few buddies will be putting on a “Test and tune” night for LEARA. It’s a great opportunity to check operation of radio equipment and make sure it is not transmitting spurs and harmonics (*cough* *cough* Baofengs *cough* *cough*). Contact Dave if you’re in the Cleveland area, or myself for the rest of the section, to have a similar program at a club meeting or hamfest. If you were involved with the State Emergency Test, Black Swan exercise the weekend of October 6 & 7, you likely received bulletins from The Ohio Digital Emergency Network (OHDEN). Eldon – W5UHQ and crew gave up a good portion of their weekend to help with this event. They did a fine job of handling bulletins from the EOC and those stations that came through on the wrong communication channels. Join them for the OHDEN net on 3584.500 USB using Olivia 8-500 set to 1500 Hz on the waterfall each Tuesday at 7:45 PM eastern. 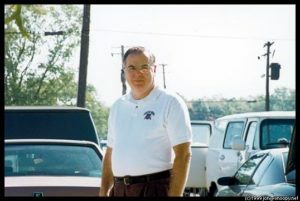 I received word that Trustee Emeritus and past long-time Treasurer for LEARA, Dave Foran – WB8APD became a Silent Key on October 10, 2018. I knew Dave for about 10 years as a member of the LEARA board and mentor but knew the impact he made on the Ham Radio community long before I was a ham. In the time I knew him, Dave was always a behind the scenes guy – rarely getting on the radio. He was instrumental in getting repeater sites and maintaining equipment for LEARA including having an input for one of the repeaters at his house. Stories have been told that his basement was the print shop for the club’s newsletter when the club had 400+ members no-less. Dave was incredibly smart with technology and the Internet before most of us knew what it was. He worked for the phone company and the joke was “Dave had half of Ma Bell in his basement.” Internet linking was something he was into early on with his own IRLP node. He owned a server that, for a long time, served resources for the Cleveland area – not only ham radio clubs but community organizations too. Maybe you even dialed into the old HamNet BBS system located in Dave’s basement (yet another reference those under 35 won’t understand). Dave was my mentor with technologies LEARA was using as I was going to be helping or taking them over. He is the reason I’m into digital modes. Cleveland’s first D-STAR repeater was in-part Dave’s doing. Of course I had problems at first and he was my go-to for questions. The little space here covers only a fraction of his involvement and lives he impacted through his countless contributions. Goodbye and 73, Dave.